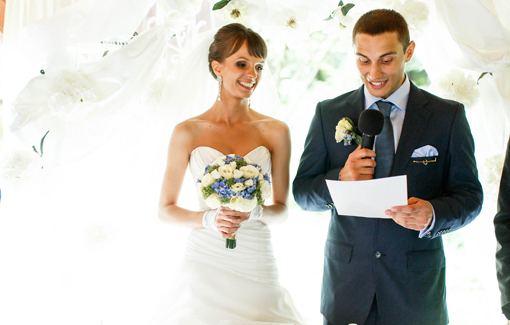 This is the easiest way to write a groom’s speech. All you have to do is fill in the gaps. Below is a groom’s speech; in places there are letters in brackets, this is where you fill in the blanks. Below the speech are some ideas about what you need to write in the spaces. All you have to do is read what to put and think of how you felt, or a real experience that you have had that fits in. It really is that easy. Good luck! Firstly I would like to say a massive thank-you from my wonderful new wife and me for joining us on this very special occasion here today. (C) Finally, a last thank-you to the best man, the father of the bride, and the bridesmaids for their speeches today. And thank you to everyone for their contributions that have made today such a marvellous occasion. Please all join me as I raise my glass to the bride, the one I love with all my heart. The bride. A) In this space, it is ideal to put all the questions to bed. For example, how did you meet? what do you see when you look into her eyes? etc. This should be quite a romantic paragraph. Tell everyone how you feel and what you see when you look at your wife, in a sensitive way but also add in a joke to break the ice. B) This is a fairly easy section to write – all you have to do is say how she has changed your life. Have you got your own place? Or say how she has made you happier than ever. Simple things, but you need to make them as interesting as you can, so if there is something that she has done to change you that has a funny story, then tell it. C) A good way to start this one is to tell everyone how you proposed, and how you felt when she said yes. Then shortly and simply say how you feel now you are married. And tell her how much you love her. 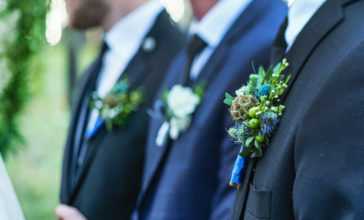 After following these three easy steps you will have a great groom’s speech, so good luck. Don’t forget that you can populate your speech with a range of jokes and one-liners from the main Groom Speech article. 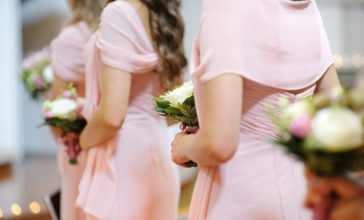 It is also wise for the Groom to praise both the Brides mother and his own as well as presenting them with flowers.